France offers a wide range of ski complexes and resorts, most of which are located in the French Alps region. Skiing can be an activity for the whole family to enjoy, with many ski resorts accommodating skiers of all ages and ability levels. In addition, France travel skiing destinations offer a variety of packages for families of all sizes and for nearly any budget. Ski resorts all over the world have grown in popularity with families. They are no longer a place for just the rich and famous. In fact, France travel resorts have broadened to accommodate all types of people, including families, and have introduced a wide variety of activities and entertainment beyond just hitting the slopes. France travel skiing options are numerous, with every special need or requirement available in the gorgeous mountains of France. The Chamonix ski resort, which is nestled in Chamonix Valley, has become one of the most popular ski resorts in France - especially for families. The 20-km (12.42 miles) valley is situated between the Mont Blanc range to the south and the Aiguilles Rouges Mountains to the north. It offers several miles of ski slopes for participants of all levels. Recent estimates suggest that the resort offers 30 km (18.63 miles) of slopes for advanced skiers, 70 km (43.4 miles) for intermediates, and 46 km (28.57 miles) for beginners. Therefore, there is plenty of variety and freedom of choice for all skiers. Chamonix itself has become popular for many reasons other than its resorts. Winter sports enthusiasts will note that it was the host for the first ever winter Olympics. It also boasts the longest cable railway in the world and is within close proximity of the highest mountain peak in Europe --Mont Blanc. Like most ski complexes, Chamonix is comprised of a number of small villages and towns. In this case, there are four main villages: Les Praz, Argentiere, Les Houches and, of course, Chamonix. When skiers can tear themselves away from the slopes of France, they can travel between villages and also enjoy a wonderful experience. Families will be captivated as they absorb the atmosphere and culture while visiting the various attractions, restaurants, and clubs within these towns. Four km (2.484 miles) outside of the center of the town of Chamonix, families can find La Grand Balcon hotel. This hotel is very typical of the mid-range accommodations found in ski resorts throughout France. La Grand Balcon, like so many other accommodations found during France travel, is geared towards groups of people and families. It includes a pool for the children to enjoy, while the parents can relax in the luxury of a Jacuzzi or a sauna. Like so many ski resorts in France, travel options at La Grand Balcon include meal quotas at a reasonable price, as well as ski passes for the slopes. For families just looking for a place to sleep, La Grand Balcon is also reasonably priced. In addition, guests are charged per room rather than by the number of guests. Each room also comes equipped with a kitchen, most modern amenities, and electronics such as a television. As with most alpine-style lodges, La Grand Balcon also offers a balcony with deckchairs on which guests can relax and enjoy the breathtaking scenery of the Chamonix valley. 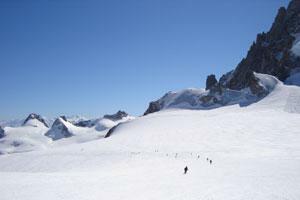 Chamonix represents only a small proportion of the France travel industry's ski resorts. There are literally dozens to choose from scattered across the mountain ranges. Les Arcs, La Plagne, Meribel, Tignes and Courchevel represent a few of the popular alternatives for those who wish to travel to France for a skiing vacation. Each destination has created its own tourist trade and has grown to accommodate all types of parties, including families. Most resorts offer children's clubs, discos, and various other entertainment sources nearby. There are also generally numerous bars and restaurants close by to amuse worn out parents. Every resort found in France offers a variety of accommodations, including chalets, hostels, and hotels. Prices for these accommodations can range from reasonable to extravagant. Therefore, families with a large budget may choose a five star luxury hotel during their stay, while families on a more moderate budget may prefer a simpler self-catering package. Families with individual needs, such as those with a child with a disability or with special nutritional requirements, can also find appropriate accommodations.